The principal aim of the ADVANCE(CAT) project is the development of medicinal products for human use, from preclinical phases to their clinical application, based on genes (gene therapy), cells (cell therapy) and tissue (tissue engineering), i.e. the development of advanced therapies. To achieve this, the project enjoys the participation of a network of Catalan entities from the field of biomedical research. These include the Barcelona Macula Foundation (BMF), which will conduct research on blindness-causing retinal diseases that lack any effective treatment in order to prevent or restore loss of vision. In the ADVANCE(CAT) project, it is important to stimulate collaboration between research centres, academics and sector companies. The aim is to create new drugs based on advanced therapies and steer them towards clinical and industrial application. To do so, the BMF, together with all the entities participating in the project, has organised a collaborative structure to facilitate innovation and technology transfer and accelerate the implementation of advanced therapies in Catalonia. Furthermore, the different agents in the sector of the advanced therapies platform are making themselves known by taking part in technical conferences and publishing in scientific journals. 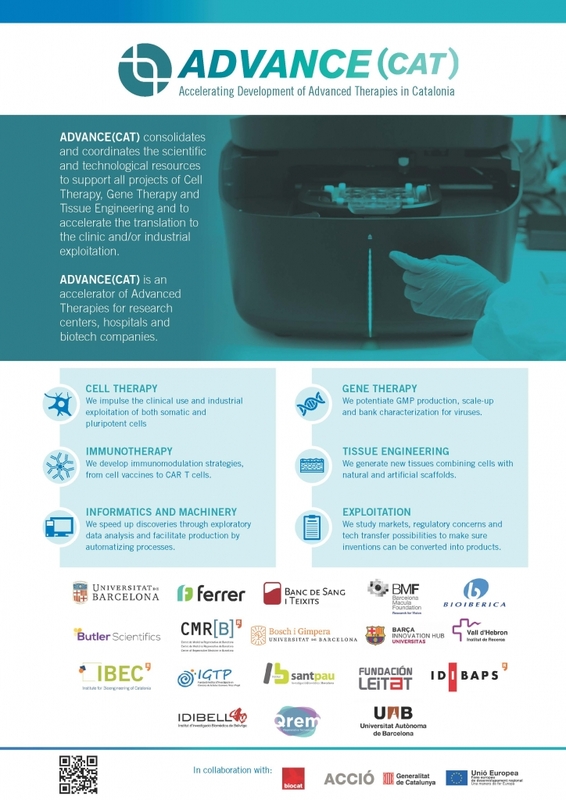 To boost this clinical and industrial application, the BMF is focusing on cell therapies in conjunction with other collaborating entities (UB, BST, FCB, FLeitat, Bioiberica, CMRB, FBiG, IGTP and IDIBAPS). The aim with cell therapies is also to exploit the potential of pluripotent stem cells (PSC) for the treatment of specific pathologies. This involves, on the one hand, embryonic stem cells (ESC), obtained from embryos that are not used for reproductive purposes, and, on the other, induced pluripotent stem cells (iPSC), obtained through the cellular reprogramming of somatic cells. PSC derivation protocols under conditions of Good Manufacturing Practice (GMP) are now being created. The facilities used comply with the specific parameters for therapeutic use, controlled by the strict safety mechanisms required by the Spanish Agency of Medicines and Medical Devices (AEMPS). One of the medical applications planned is the obtaining of retinal pigment epithelium (RPE) cells from PSC and their subsequent application in animal models. Here, the Centre of Regenerative Medicine in Barcelona (CMRB) and the BMF play an important role as they are the entities commissioned respectively with generating the RPE cells and utilising them in trials with animal models. In this case, the pig eye is used as an animal model, as its size and the structure of its retina are similar to a human’s. An atrophy model is induced in them and RPE cells are then implanted. These experiments seek to restore the atrophy phenotype in the animal model and achieve a safe, reliable PSC differentiation protocol for its clinical application. 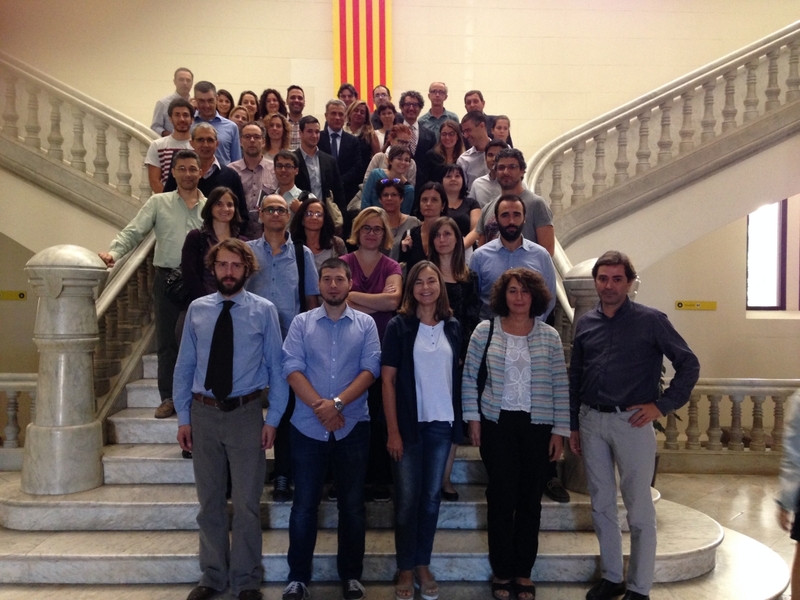 This project forms part of the action plan of the RIS3CAT community “NEXTHEALTH: Multidisciplinary solutions for the coming challenges in health”, coordinated by Biocat, and groups the sector’s public and private entities to obtain the greatest benefit from the Catalan Health System. The consortium’s starting budget is 2.8 million euros, in which 969,352.28 is co-funded by the Catalan Agency for Business Competitiveness (ACCIÓ) and the European Union, within the framework of the ERDF (European Regional Development Fund), Catalonia 2014-2020.